The West Hill - Highland Creek Lions Club's planned "Spookie Spiel" was regrettably cancelled due to not enough teams signing up for it. The event will be likely be relaunched next year in a different format. The West Hill - Highland Creek Lions Club assisted the West Rouge Senior's Association in serving hamburgers and hotdogs at the West Rouge Sports and Recreation Association's annual Family Fun Day. Thousands of people attend this event each year and this was no exception. Several members of the West Hill - Highland Creek Lions Club were on hand to help out in a community day event co-sponsored by area Lions Clubs and IBEW Local 353 held at Broadland Park located at 19 Castlegrove Blvd. (North of Lawrence between Victoria Park and the Don Valley Parkway). The event had food, games, prizes, crafts and sales. This community event was fun for whole family. The Lions Clubs will be using the money raised at this event to help cover the startup costs for a much larger 2008 event. Several members of the West Hill - Highland Creek Lions Club were on hand to participate in a ceremonial cheque presentation for the club's community beautification project. The project is the first of what is hoped will be many similar projects by Lions Clubs in Toronto. Under the city's beautification program, the clubs identify a parcel of city-owned land to turn into a small park or garden. In this case, the West Hill - Highland Creek Lions Club identified a quadrangle of land where Old Kingston Road meets Kingston Road to focus their attention on. Lion Marius Ois, a professional landscape architect, drew up plans and presented them to the City where they were quickly approved. Today's ceremony brought together the City and two community sponsors to present cheques to the club to begin work on the project. The City, FCB Property Management Inc., and Sisters Restaurant each presented the club with a cheque for $1,500, giving the Lions $4,500 with which to start work. With more than 20 vendors signed up and better crowds than we've seen in recent years, the Lions Club is pleased to call the Spring Craft Sale held today at the Heron Park Community Centre a sucess. A number of Lions were present to help out with the setup and to run the canteen. Selling pop and other beverages for $1.00 and jumbo hot dogs for $2.50, the Lions were able to raise a little money towards their numerous community commitments. 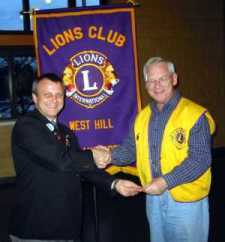 Members of the West Hill - Highland Creek Lions Club attended the annual district convention where they met International President Jimmy Ross. The West Hill - Highland Creek Lions Club donated their bingo machine to the Heron Park Community Centre where it will be available to other community groups. The West Hill seniors club will be one of the main users. 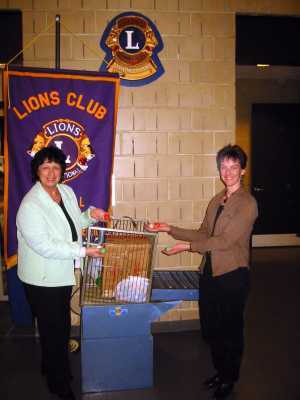 The Lions Club had used the machine for many years but have not needed it recently. We are pleased to see it being put to use once more. The photo shows Past President Terry Fontana presenting the machine to Jennifer McPherson. 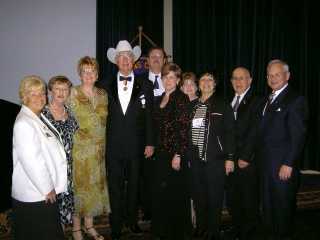 District Governor Paul Baker today recognized the decades of service of several club members. Shown in the picture to the left is 20 year Lion Marius Ois, while on the right, Lion Terry Fontana was recognized for 30 years of service. Lion Ray MacQuarrie, who has served for 40 years, was not able to attend. 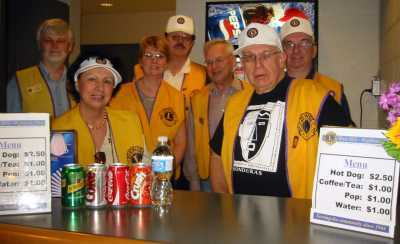 The West Hill - Highland Creek Lions Club hosted the Region 58 Lions meeting. This is a quarterly get-together to allow clubs to share ideas and discuss issues. The affair was catered by Sisters Restaurant. The West Hill - Highland Creek Lions Club took the opportunity to announce our upcoming "Spookie Spiel". This is an open (anyone can enter), mixed (men and women alternate positions on each team) bonspiel which will be held at the Tam Heather Curling Club. Further details will be available on the Events page.